Are you interested in visiting attractions of bono waves that exist in the Kampar River Riau, Indonesia? You should make sure to know when the right time to visit the location of the greatest tourist site. Visiting to the site of bono wave at the right time will surely make your visit more rewarding, because you will be able to see the bono waves with better heights. Especially for those surfers who want to enjoy the river and conquer the wave heights that is very stimulating the body's adrenaline hormone. At the right time, you can meet and surf with other surfers from different countries, which of course will make you expand more and more experience in surfing. Bono usually occurs on every date 10-20 of Malay month in Arabic Year that is commonly referred by local people to as "Big Moon" or "Full Moon”. Usually, bono waves are significant at 13-16 months of the Malay in Arabic Year. Wave that occurs usually is in white and brown color, it is following the color of the water after Kuala Kampar. In addition, bono also occurs on every “dark of moon" that is the end and the beginning of the month (first date) on Arabic Year. The greatest bono usually occurs in the rainy season when the water flow is large enough in Kampar River, about November and December. Bono began to form and grow on either side of Muda Island, due to the narrowing of the river channel because of the island (Muda Island) in the middle of the river channel. The greatest bono occurs in Tanjung Perbilahan, which is formed due to the meeting of bono that had formed on either side of Muda Island. Depth of the river around the bono waves is not deep, only about 1-2 meters with part of a certain flows that have depth of 10-15 meters to flow the ship transportation. Nevertheless, this flow is always moving due to fundamental shifts in the river because of the bono waves. 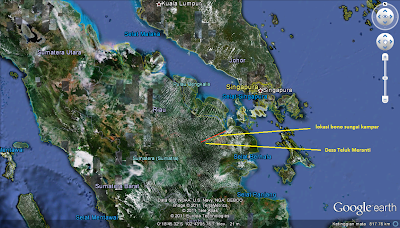 Therefore, for the ships that would pass through this area to get out of the Kuala Kampar to Tanjung Batu, Selat Panjang, Tanjung Pinang, Batam, or even Singapore should use people who become directors or commonly called "tekong" to indicate that the flow can pass through the ships. 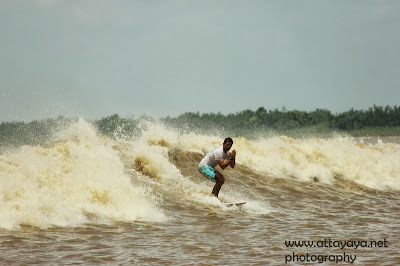 Having regard to the time schedule about the bono waves, of course, could be a reference for you to choose the right time to visit to Meranti Bay, where the location of the male bono waves that are recognized as the world's biggest bono waves. Bono in Kampar River is one of the world wonders from Riau for Indonesia. Scientifically, bono waves are one of superb natural phenomenon that rarely occurs. The waves are big like we usually find at sea, but they are formed in a river. 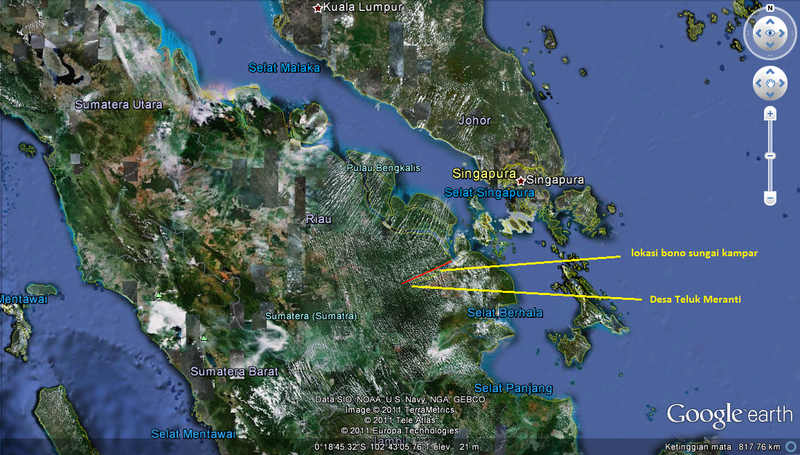 Bono waves are formed due to the impact of three currents from Melaka Strait, South China Sea, and Kampar River. Because of the impact, the waves in the Kampar River estuary can reach up to 4-5 meters in height with a thundering sound ahead. Only intellectuals believe at this scientific phenomenon. Meanwhile, local people have their own legends about that Bono wave. Many stories and myths from local people make this superb phenomenon more appealing. Local people believe that Bono waves in Kampar River is the Male Bono and Bono waves in Rokan River is the Female Bono, near Bagansiapi-api city. Bono in Kampar estuary consists of three waves which look like horses and called the Bono mother. On very high tides, Bono will go to Rokan River meeting the Female Bono, then, heading to Malaka strait. That is why on half-moon or very low tides, Bono is not found in both rivers. During the moon’s quarter phase, Bono is back to its origin place and passing Kampar River and Rokan River. On the full moon, bono is racing on both rivers. Local people of Kuala Kampar are already familiar with Bono since childhood. That is why children, teenagers, and adults regard Bono as their friends where they can do an agility game canoeing on Bono, they called Bekudo Bono. 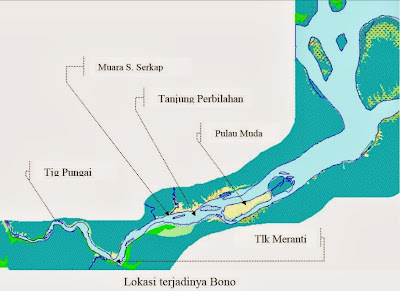 Local people often go to areas where bono is not too big such as in confluence of Kampar River (Sangar River, Turip, Serkap, Kutub, and Kerumutan River). The game is too risky; your canoe will be thrown into the cliff and crashed into pieces once you make a mistake. However, since childhood, the Bono players already know exactly the safe place to play with Bono. In the past, a particular ceremony is held before playing with Bono to ensure the players’ safety. The ceremony is named Semah which should be held at morning or noon. This ceremony is led by a Bomo or Datuk or an elder in the village. The purpose is to ensure the safety of all players when riding the Bono and to protect them from any danger. Besides, there is a mystical story related to Bono waves, a story about bloodbath in Mempusun or Mempusun is Covered by Blood and the establishment of Pelalawan Kingdom in 1822 AD. People say that Malay warriors are often challenged and tested their agility by riding the Bono waves. Whoever succeeds conquering those strong waves will be regarded as a powerful warrior with a great strength. Another story tells that the waves formerly consist of seven big waves of ghosts. In the Dutch colonial era, Dutch's ships were hardly entering Kuala Kampar because of this wave. One of the Dutch commanders gave an order to shoot the big waves. Wondering why, one of the big waves shot by Dutch cannon never appear until now. Thus, only six Bono big waves remain this day. However, the game becomes a regular game which can be played anytime. But, the game is only done during the day, whilst no matter how brave they are, they do not dare to try it at evening. It is because the risk is too high. If you are afraid or terrified to take part at Bono game, you can watch Bono from the land. If you dare, you can play with many small boats available there. The important thing is you should be a good swimmer as you drive the Bono. This game is similar to surfing on the waves at a beach because the area is large with a big challenge. For the people of Indonesia, of course, are familiar with the term of bono, or bono wave. Bono waves are waves that are caused by the meeting between the rivers flow with ocean stream. 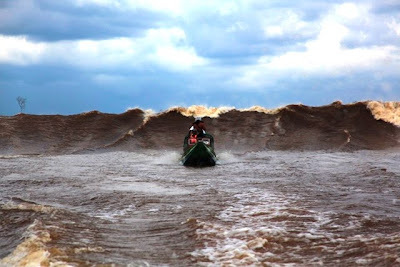 In Riau, Indonesia, precisely in the mouth of Kampar River, there is a natural phenomenon that is huge waves called as bono wave. The existing of bono wave occurs due to the collision of three water flow from the Malacca Strait, the South China Sea, and the Kampar River water flow. 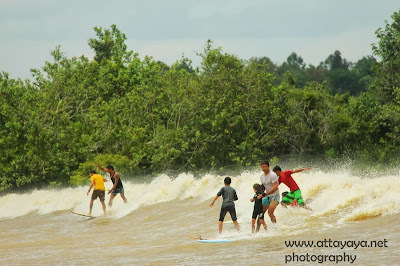 Bono waves that exist in the Kampar River are known as the largest bono wave in the world. Actually, there are many bono waves going on in several places in the world. In every part of the world, we can find a wide range of bono waves with a diverse and names that are also quite varied. 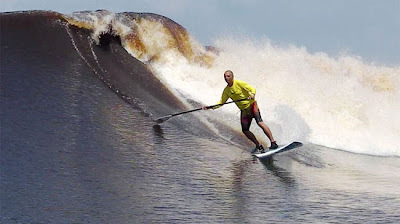 In addition to the bono wave of Kampar River, the bono waves in Amazon River is also recognized as the bono waves that were quite large, but the size of height is still below the bono wave in the Kampar River. d. Qiantang River, China, sometimes referred to as the largest bono wave and be opponent of the bono waves in Kampar River, Riau. They have almost the same of height about 6-10 feet into the upstream with speed of 40 km/hour. e. Lupar River (Batang Lupar River) near the town of Sri Aman, Sarawak Malaysia. The local people called bono in Batang Lupar as Benak Batang Lupar. Besides in Sarawak, bono or benak also occurred in Batang Sadong River, Batang Samarahan River, and Batang Saribas River. g. Bono Kampar (Kampar River Bono Wave), Indonesia. Some mentioned that bono waves can go to upstream as far as 130 miles with the height of 6-10 meters. Bono Kampar is considered to be the biggest wave. a. Trent River, West Stockwith, Nottinghamshire. The British called the bono in Trent River as Trent Aegir and as a tribute to the Humber Estuary. d. Severn River (The Severn Bore on the River Severn), Wales and England, high waves up to 2 meters (6.6 ft). n. Ribble River, Lancashire. Bono in Ribble River enter to the branching of Douglas River and Preston River. Bono on the America occurred in Cook Inlet Bay that goes through to the branch of the Turnagain Arm River, Alaska. The wave height can reach about 2 meters (6.6 ft) with speed of 20 km/h. Cook Inlet is a bay area in Alaska which is the mouth of two rivers namely Knik Arm and Turnagain Arm. Bono Mexican waves generally occur from the Sea of ​​Cortez who entered the mouth of the Colorado River. Bono waves begin to form around the Montague Delta Island which then enters the river. 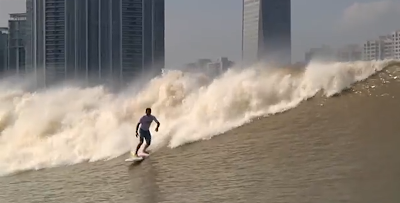 Bono waves also occurred in Qiantang River China, and the people there called the Silver Dragon. Bono waves in Malaysia called Benak occurred in the river ( Trunk) Lupar in Sarawak where the water comes from Kapuas Mountains and empties into the Gulf of Datu leading to the South China Sea. Rokan River in Rokan Hilir Regency which has a name Female Bono. The second and biggest in the Kampar River in Pelalawan Regency, precisely in the village of Teluk Meranti. Surrounding community call the waves as Male Bono or Bono. Bono in Teluk Meranti village into a great surf spot because it has a mileage about 30 km long. Although the length of the river from the estuary to Teluk Meranti village is about 60 km. 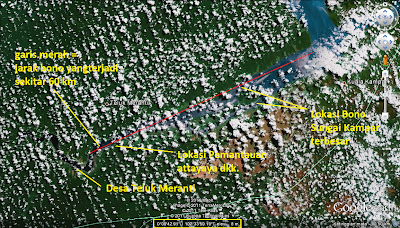 If we go from Teluk Meranti village, we can waiting bono Kampar waves at the point around Pulau Muda or after Muara Serkap (Serkap Estuary spot). Several rivers in other countries also happen Bono wave phenomena with the mention of different name in each region / country . As Indonesian society, we should be proud of having a natural phenomenon which is quite rare and be the greatest miracle in the world. However, proud of it there's no point, we have to support and help introducing this one of Indonesian tourist wealth to the international world. Waves or tides are generally formed due to water or wind flow changes occurred in the foreshore or seaside, the billows are used for surfing. Hence, watching people surfing on the beach is a common thing. But, watching people surfing on river stream is something unusual. The activity is a surfing activity with a surfing board on the waves, not rafting or canoe paddling. Surfing on river can only be done in few places in the world. Those places are supposed to have current waves which form big and long river waves. 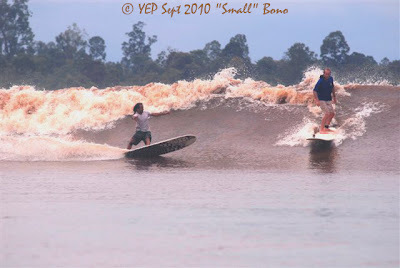 One of places where we can surf on the river is in Indonesia, besides some rivers in South America, China, and Europe. This must be our pride. The exact location is in the estuary of Kampar River – Kuala Kampar Sub-district – Pelalawan Regency – Riau Province – Indonesia. The river waves are called Bono waves or Bono billows. The smaller Bono is located in the estuary of Rokan River – Rokan Hilir Regency, Riau Province – Indonesia. Bono that is waves or tides occurred in the estuary of Kampar River, Riau, Indonesia is a natural phenomenon as the result of the encounter of river stream to sea and ocean currents into river due to tidal. According to some international surfers who have surfed in Bono waves, Bono waves are the biggest river waves they have ever come upon. WHAT LOCAL PEOPLE SAY ABOUT BONO? The estuary where Bono is formed is named Kuala Kampar by the local people. The waves can reach up to 6-10 meters in height depending on the circumstances of when they occur and the point location. Based on Malay folklore entitled Sentadu Gunung Laut, every warrior in Malay coast has to conquer Bono Waves to improve their fighting skills. Beyond mystical things, it makes sense as “riding” Bono can be defined as maintaining body balance. Bono is actually located in two places, the estuary of Kampar River and the estuary of Rokan River. Local people call Bono in Kuala Kampar as Bono Jantan (Bono Males) because the waves are big, and Bono in Kuala Rokan as Bono Betina (Bono Females) because the waves are small. In the past, because of mystical belief in that location, there must be “Semah” ceremony held at morning or noon prior to riding Bono. The ceremony is led by BOMO or Datuk or the village elder to utter a prayer for the Bono riders to be always safe and protected from any danger. 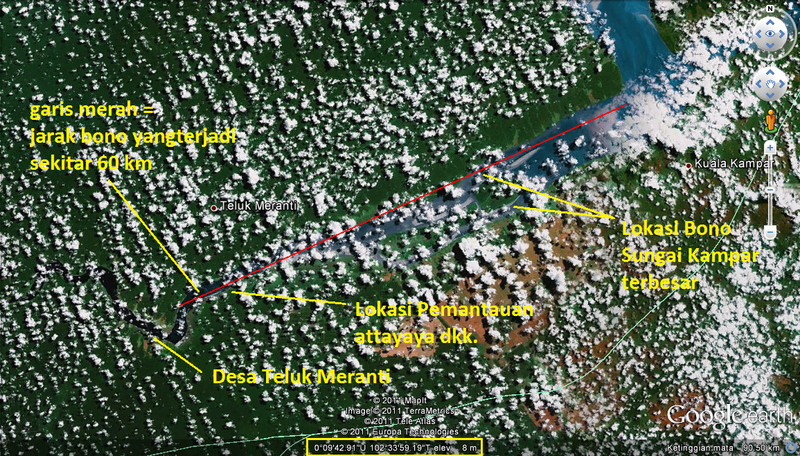 In addition to mystical story that (maybe) corresponds to Bono waves, there is a story about Banjir Darah di Mepusun (Bloodbath in Mepusun) or Mempusun Bersimbah Darah (Mempusun is Covered by Blood) and the establishment of Pelalawan Kingdom 1822 AD. Today, local people in Kuala Kampar regard Bono as “friends of nature”. Brave local people will “ride” Bono with their canoes not with usual surfing boards. Canoeing on Bono waves becomes an agility activity. Otherwise, this activity is too risky as making a mistake on canoeing will make the canoe slammed by Bono waves; usually the canoe crashes in pieces. Based on Malay folklore, Bono waves occur due to the embodiment of seven ghosts that usually crash canoes or boats crossing Kuala Kampar. The big waves are very terrifying for local people, there must be Semah ceremony held like explained above to across it. This wave is very deadly whenever canoes or boats dealing with it. Frequently, canoes crash in pieces because of being hit by the waves or wrecked because of being pushed away by waves then hit the river bank. Many boats have to turn back or sink because of it. Based on a story from local people, there were seven billows formed by seven ghosts. In the Dutch colonial period, the Dutch’s ships are hardly entering Kuala Kumpur because of this wave. One of the Dutch commanders ordered to shoot the waves with cannon. Wondering why, one of the billows shot by Dutch’s cannon never has never shown up again until now. That is why there are only six large roll Bono waves now. Seven ghosts or Seven Ghost Waves are seven Bono roll waves with a formation of one roller in front and six others following behind it. Because one of the billows was crashed by Dutch, there are only six remaining with a formation of almost on a line entering Kuala Kampar. The Dutch’s ship and the people have never been found until now. The Seven Ghost Waves can appear in specific spot locations. From the study of Environmental Fluid Mechanics, Bono is called Tidal Bore or tide-bore/bore/aegir/eager.eygre. Actually, Tidal Bore is formed in many countries with different shapes of roll waves. That is why Tidal Bore is named after their local names. In Riau, it is named Bono, Malaysia names it Benak, in Ken River England, it is called Arnside Bore and some others name it Aegier. It is called Pororoca in Amazon River, Un-Mascaret or Le-Mascarin in France. 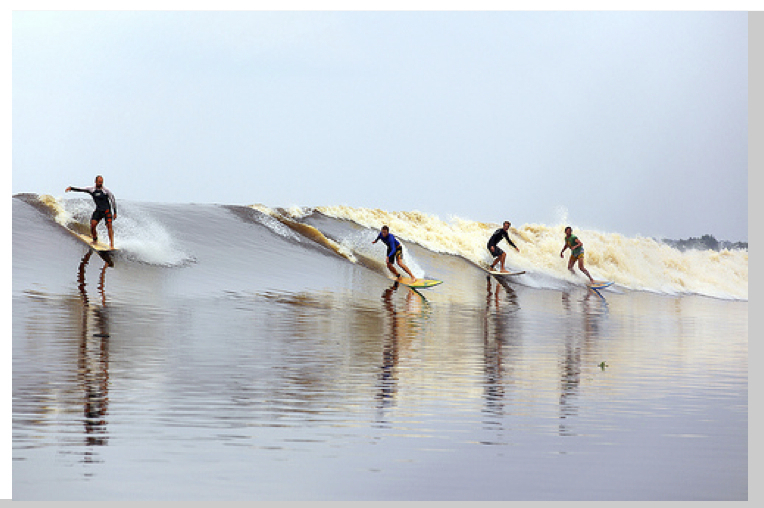 Bono Waves are formed when the tidal wave occurs and sea water is entering Kampar River. The sea water velocity entering the river meets in position with river stream going towards the sea. The waves are the result of clash of the two currents. Bono is formed only with tidal waves. And, it will be bigger when sea water is in large tidal wave with driving rain in the estuary of Kampar River. The swift river streams due to rain will collide with the swift tide of sea water entering Kuala Kampar. The Bono wave’s formation begins with a whistling sound followed by the roaring water sound. The roaring sounds grow louder like a boom of thunder accompanied by Bono magnitude waves. Today, the sound can be heard when Bono waves occur in the night. In one day (24 hours), Bono will occur two times, high tides at noon and at night. Usually Bono at noon is bigger than Bono at night. But, because of the place and environment conditions, the Bono’s sounds at night are louder. The Bono wave’s velocity reaches up to 40 km/h and even 60 kilometer away to the upstream when entering it kilometers away and ends in Tanjung Pungai. The number of Bono wave is more than one which is usually going along or on a line. Sometimes, the waves are on the left and right side of river banks, sometimes gathered in the middle of the river. The waves formed are usually in white color or brown similar to Kampar river water color. Sizes of Bono waves vary depending on the location, the time, and the river stream velocity. The velocity is influenced by wet season both in the headwater and downstream, and along Kampar river watershed. Bono is usually formed on 10th-20th of Malay month in Islamic year which is usually called as old moon (bulan besar) or full moon (bulan purnama) by local people. The big Bono waves are commonly formed on 13th-16th of Malay Month in Islamic year. Besides, Bono is also formed every waning month (bulan mati) which is at the end and beginning of the month (from 26th to 1st of the next month). This schedule is made by Attayaya based on moon phases. The schedule of when Bono Kampar River 2012 formed is calculated by Attayaya Zam based on the month and year of Malay calendar or Hijriyah calendar 1433-1434 H.
(F) = Full moon/the middle of Malay month. (W) = Waning moon/the beginning of Malay month. (B) = Bono Waves of Kampar River which has big shapes from 4-6 meters in height. Besides, the average waves are 3 meters in height. Bono waves are formed in the estuary of Kampar River. The nearest village to the location with lodging facilities is Teluk Meranti village, Kuala Kampar. Meanwhile, the surfing location is around Pulau Muda village. From Teluk Meranti village to Pulau Media village, speed-boat transportation is available to take about 30-40 minutes. The location of Bono waves can be reached from Pekanbaru city to Pangkalan Kerinci (the capital city of Pelalawan regency), then head to Teluk Meranti village. The trip can be made by using land transportation (car, bus, motorcycle). The trip takes about 5 to 6 hours depending on the road conditions and traffic jam. The trip from Pekanbaru to Pangkalan Kerinci passing through Eastern Sumatera Causeway (Jalan Lintas Timur Sumatera) takes about 1-2 hours. From Pangkalan Kerinci to Simpang Bunut, it takes 30 minutes and gets into the Bono Causeway (Jalan Lintas Bono) to Teluk Meranti village which takes about 3-4 hours. By water transportation, the location can be reached through Pangkalan Kerinci harbor beneath Pangkalan Kerinci Bridge. From the harbor, we can take speedboat to Teluk Meranti village which takes 4-5 hours by paying 125.000 IDR/person. Taking the trip with your own vehicle is better as you can arrange your departure schedule without depending on public transportations’ drivers or waiting other passengers. Pekanbaru – Pangkalan Kerinci (25,000 IDR/person). Pangkalan Kerinci – Teluk Meranti village (55,000/person). The lodging at Bono is usually still in local people’s houses (homestay) and the cost is about 50,000 IDR – 100,000 IDR per room for two people. Since Bono waves neither look beautiful enough nor big enough in Teluk Meranti village, need you to rent speedboat to Kuala Kampar around Pulau Muda village to watch beautiful Bono waves. The rental fee depends on the desired distance of location from 300,000 IDR – 600,000 IDR per speedboat. You can rent the speedboat to follow wave’s movement, so the speedboat will be in front of the waves in the secure distance. The local people can show you the location of the best, biggest, and longest Bono waves. ENJOY YOUR TIME! 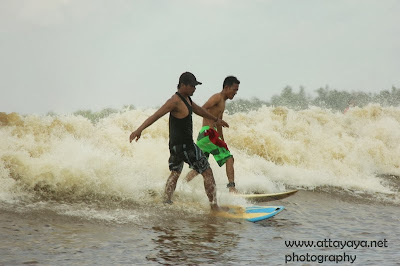 HAPPY SURFING ON BONO WAVES KAMPAR RIVER! READ MORE - Enjoy Bono Waves Kampar River!